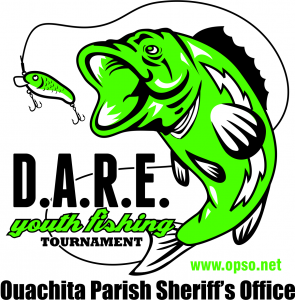 The annual Ouachita Parish Sheriff’s Office D.A.R.E. Youth Fishing Tournament will be held Saturday, September 13, 2014. Fishing will begin at 7:00a until 11:00a and participants may fish any public or private waterway within Ouachita Parish. You do not need to report to the tournament headquarters before fishing. Bring your biggest fish (any species) to the weigh in. Weigh-ins will start at 11:00a at the tournament headquaters located at the Ouachita Parish Sheriff’s Office Rifle Range (357 Richard Fewell Road West Monroe, LA). The awards ceremony will start at 12:30p. Along with weigh-ins, there will be free food, youth activities and door prizes. Awards will be given for biggest fish in each age category. The event is open to all children ages 2 to 12 years old. Participants do not have to catch a fish to be entered into door prize drawing but must check in at the tournament headquarters to be entered. Fishing poles and bait, courtesy of Armstrong Cricket Farm will be available at the tournament headquarters for those who need supplies. Event will not be cancelled or rescheduled due to rain. • Adults may cast and assist landing the fish for the participants in the 2-6 year old division. • Only one fish allowed at weigh-in, dead or alive.